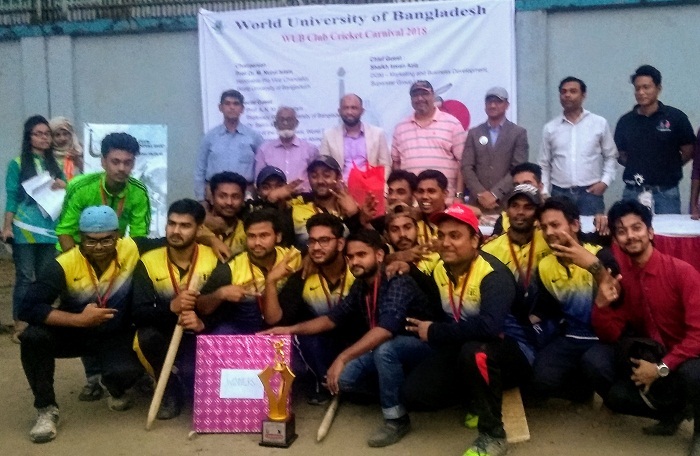 WUB Business Club, World School of Business, World University of Bangladesh organized a three-day long cricket tournament titled “WUB Club Cricket Carnival 2018” from November 18, 2018 to November 20, 2018 at BG Press Sports Ground, Tejgaon, Dhaka. Twelve teams from different clubs of eleven departments participated in the tournament. The tournament was divided into two stages. In first two days all the matches of group stages had been completed. Subsequently, four different teams (e.g. WUB Business Club, WUB Civil Eng. Club, WUB EEE Club Day, WUB EEE Club Eve.) succeeded to play in the final stage. In concluding round, the 1st Semifinal match started at 9:00am. on November 20, 2018. Gradually, the 2nd Semifinal match and final match had taken place consecutively. Finally, WUB EEE Club (Day) clinched the title of “WUB Club Cricket Carnival 2018” as a Champion team. Man of the series had been given to Mr. Rubel of WUB EEE CLUB (Day). The final day of the tournament was followed by a colorful ‘Prize Giving Ceremony’ participated by winning team, runners-up team and by the colorful spectators. Honorable Pro-Vice Chancellor, Professor Dr. M. Nurul Islam, World University of Bangladesh presided over the Ceremony as a Chairperson. Shaikh Imran Aziz, DGM-Marketing & Business Development of Superstar Group Ltd. graced the program as a Chief Guest. Dr. Selim Ahmed, Head, World School of Business attended the program as a Special Guest. Apart from this, Mohammed Tanvir Zubair Ahmed, Moderator, WUB Business Club were also present in the Ceremony, together with the three-day long effort to make this Carnival success. Most of the faculty members of World University of Bangladesh and a full gallery of students were present to enjoy the matches.